On Friday I found myself walking home in an all out monsoon. I’m talking sheets of rain buffeting down. It didn’t just seem like rain, it looked as if springs were erupting from the ground. Within five minutes, the area around me, that had previously been completely dry, resembled something more akin to a lake or a rushing river. My phone still hasn’t recovered from the deluge of rain. I have an android touch screen phone. After its involuntary shower, my touch screen is a bit finicky. Now it’s more of a picture that I can move my finger on than an electronic device to interact with, but oh well. For me, getting caught in the rain was a spot of fun. Sure it made my oxford blue shirt and black dress slacks soaked, but that doesn’t matter to me. It was an experience, and truth be told, not that much different from other experiences I’ve had while traveling the world: fun, unique, and sometimes uncomfortable. I had to walk in this torrential down pour for about ten minutes before I was able to finally flag down a songthaew. In case you don’t know, a songthaew is a means for getting around in Thailand. At best, it’s a small pickup truck with a cab cover complete with benches equipped for sitting. At worst, it’s a hotwheel sized pickup truck with the same cab cover that makes me feel like I’m visiting a Bilbo’s house in the Shire. None of these devices are private, meaning, that I never ride solo. In fact, it is a modern marvel how many souls they can fit into one of those songthaews. Every time I ride one, I am squashed against ten of my closest strangers in a very intimate way. In most of them, I can’t sit up straight, and my legs occupy the entire vehicle. Regardless of how comfortable or uncomfortable they are though, I love riding them. Not because of the comfortable (because they’re not), but because of the experience. On Friday, I was just happy to see it because of the driving rain storm. I was concerned that the driver wouldn’t be able to see me in the driving rain, but somehow he did, and he pulled off, steering the songthaew to the side of the road. As he came to a stop next to me, I received a shower from the water displaced by the songthaew’s motion. But what did I care, wet is wet right? I jumped into the back with a big grin on my face. I was having fun. How often do I get caught in the rain walking? Well it happened in Japan, but really, before I traveled the world, this type of thing never happened to me. I always had a car or an umbrella, and this was a fun experience. To my surprise, as I entered the back of the red and white songthaew, everyone scooted over for me. Normally, I have to awkwardly shimmy over people, apologizing for the toes I’m crushing along the way. But on that day, everyone moved as if I were royalty. At first I was flattered, but I quickly learned why they did this: during a rainstorm the back of the songthaew is like being in the splash zone when you go see Shamu. But again, what did I care? I was already soaked, and at this point, I was having more fun than if I was actually at Seaworld (Incidentally, I’m not joking. I went to Seaworld in January, and I’ll take the songthaew any day). I raised my head to greet all of the individuals around me with my best saw wa dee krap and sa bai dee mai krap. Or “hello” and “how are you?” but as I did, I noticed something. These people weren’t smiling like I was. They were despondent at worst and melancholy at best. I wondered what was happening to these people that to make there countenance so? Weren’t they in the same rain storm that I was? Weren’t they wet like me? Why weren’t their faces full of merriment like mine? The answer hit me, and for a moment, my expression matched theirs. I’m an American, and any time I ride a songthaew, I’m slumming it. I’m riding it by choice for the experience of seeing what it is like to live like a Thai person. I eat Thai food, drink Thai drinks, and ride songthaews all for an authentic Thai experience. As I looked at their faces, another thought occurred to me. What if I didn’t have a choice? What if this life, these songthaews, this food, this paltry amount of devalued currency wasn’t a season in my life, but was the whole of my existence? No hope of escape or change, just the same bleak reality for the rest of my life. Every day would be pretty much the same, only made worse when something like rain took something hard and made it a little bit worse. I looked at the face of a Thai baby sitting on her mother’s lap and realized that unless that Thai child is very lucky, her life would never be different from everyone on that songthaew. 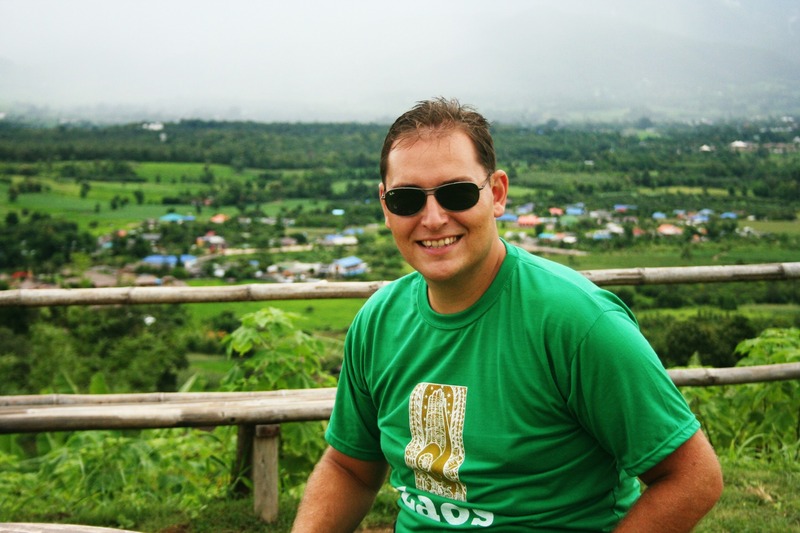 At my school, I am one of the highest paid teachers, making 30,000 baht (1,000 US) a month. Talking about salaries isn’t taboo in Thai culture. One of the first things they talk about is how much money they make. Most make around 20,000 baht, some make as little as 15,000. That’s teachers, not the folks that work at Dairy Queen or the movie theatre or at the local food stand. I have no idea what they rake in, but it can’t be much. Numbers like, 30,000, 20,000, and 15,000 baht are fairly intangible, so let me try and place that into context. That much money means that they will always be riding on songthaews. They will never afford a car (the cheapest I’ve seen is 600,000 baht) or travel. For them their life will consist of working six days a week, ten hours a day, all for around $10.00-$20.00 a day. And while things are cheap in Thailand, they are not that cheap. That amount of money is only enough to survive. I like to think of myself of experiencing what is to be Thai, that I’m getting down in the mud with these people and experiencing what they experience. But the truth of the matter is, I cant. No matter what I do, I’m only a visitor, someone exploring their way of life. Someone who doesn’t and cannot know the hopelessness that I saw in the faces riding with me on that songthaew. Most of the time, I don’t see those faces. I see only smiles. Smiles amidst what most would call some form of poverty. Thai’s are an amazing people, and I am enjoying my time among them. On Friday though, amidst the storm clouds and the thunder overhead, I saw a different face than I had seen before. One not content with the every day ho–hom that is existence for them. When I saw those faces, I realized that this is how the other half lives, and I couldn’t help but wonder if that’s what they think when they look at me, smiling in the rain. Tags: Bilbo's house, dress slacks, getting caught in the rain, living like Thai's, rainstorm, songthaew, teacher salary in Thailand, Thailand, the other half, transportation. Bookmark the permalink. Try to put your phone a bowl of rice!! It will soak up all the water!! You are the second person who has told me that, must be true! I’ll give it a try! Only it’s not the other half, it’s the other 95%. Something we often forget. A thought provoking post, thanks. Great post, Jarrett! Having grown up in the Philippines, I lived that life. My Dad still makes $250 a month being a “tax collector” (they have a fancy name for it, but a crappy salary). He’s been on the same job since before I was born. Happy birthday btw, you and I are the same age. 🙂 but yeah, I keep telling my kids now how lucky they are to have a nice house, car and food to eat everyday. When I was growing up, my family didn’t have a car so we used public transit a lot and yeah, I got wet a lot from the rains. Now they have a little car back home but my dad’s salary didn’t buy it, a wealthy uncle gave it to us since his daughter in law got a new car. My mom struggled to put food on the table and the only reason I was able to go to college was because of my mom’s sister supporting my education. I have been supporting my family since I finished university and now, my husband and I do..but you know, it’s still not enough for them to live comfortably. I feel like they’re stuck in that rut forever. Sorry for this long comment , but this post struck home with me. Wow, thanks for taking the time to share. Great to hear a first hand experience. It’s impossible to imagine what that must feel like. I’m so glad you let me know. Love this! Love seeing the world through your eyes. You are one super cool dude:) love you J-Rock! I look forward to every post you do! You write soo very well! I’m looking in on how to block you from viewing my website. I called homeland security, they’re on it. But seriously, love you too. haha, you will never get rid of me nomatter how hard you try!!!! Wow. Well written and thought provoking. Thank you for sharing this with us! Happy belated birthday, Jarrett! Just posted to Twitter but can’t find your name or # there. My e-book is on my sis’s Kindle and I cannot wait to read it. And yes, I am on Twitter! My twitter name is Jarrett_ingram! I’ll make a post on it so everyone will know. Amazing experience! And you write about it with such eloquence. You are an amazing writer. And I love following the Trek stories. Thanks Mike! Did you have a chance to read Following After Trek yet? Great thoughts and wonderful blog. We do take things for granted and I’m glad you’re trying to see things as much as possible through their eyes. I would’ve loved to see you “dancing in the rain”! Thanks for sharing! Lots of love! Thanks Lacy! Your email made me blush all the way in thailand. Thanks fur the wonderful comment! Have fun finishing Following After Trek! PS Looking forward to book 3 from you as well!